(Lustig, Alvin - jacket design) Lawrence, D.H.
New York: New Directions, 1950. Rand, Paul (Yusaku Kamekura, editor). Paul Rand: His Work from 1946 to 1958. (prospectus). Minnneapolis: Walker Art Center, 1959. Machines de Tinguely. Exposition realisee par le Centre National d'Art Contemporain. 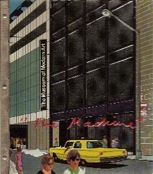 The Machine as Seen at the End of the Mechanical Age. New York: Museum of Modern Art, 1968. (Lustig, Alvin - designer) Acton, Lord (John Emerich Edward Dalberg) . Essays on Freedom and Power. Selected and with a new introduction by Gertrude Himmelfarb. London: Thames and Hudson / A Meridian Book, 1956. Sutnar, Ladislav & K. Lonberg Holm. Catalogue Design Process - a prospectus. New York: Sweet's Catalogue Service, n.d.
Ladislav Sutnar: Visual Design in Action. Cincinatti: The Contemporary Arts Center, c. 1961. Charger Tag, in white and manila. Knightsbridge, Ohio: Champion Papers, N.d. c. 1950. How to Show Telephone Numbers on Letterheads. N.p: Bell System, n.d. c. 1945-55. Carrs, Creating a Store Personality - [Sutnar, 1956-57]. Adventures with a Logotype - "Addo-X" corporate image development details - [Sutnar 1956-59]. An Interval of Design Freedom - [Sutnar, 1960]. Sutnar, Ladislav (Sweet's Catalogue Service). What? Why? How? Essential Product Information. New York: Sweet's Catalogue Service, 1942. (Wim Crouwel & Jolijn van de Wouw - Total Design) Stedlijk Musuem. Op Losse Schroeven. Situaties en Cryptostructuren. Traktat o sploshnom neprilichii (Treatise on Total Obscenity). a selection of books designed by some of the 20th century's great designers, and a few unusual items with cover art or typography by surprising contributors. to purchase or inquire, please contact us.